The month of May was a successful month for the Phillies, but it didn't really feel that way. May was an example of why they say "pitching and defense wins championships" and showed why the Phillies went out shopping for Cliff Lee. Despite a putrid offense, the Phillies rode their starting pitching and just kept winning. They followed up an MLB best 18-8 April record with a 16-13 record in May and increased their NL East lead slightly. A third of the way through the season, the Phillies are the best team in baseball. May gave the Phillies their toughest test of the season. After a relatively easy schedule in April with games against bottom dwellers, the Phillies faced a stretch of 21 games against teams with winning records. To make matters worse, the Phillies were destroyed by injuries. Roy Oswalt, Carlos Ruiz, Shane Victorino, Brian Schneider, and Joe Blanton each spent times on the DL. The injuries had a definite impact on the team, as the Phillies played 5 straight games with 5 hits or less and they lost 4 of their first 10 games of the tough 21 game stretch. But as players returned from the DL, the Phillies fought through it and won 7 of their next 9. With nearly everyone back, it is quite possible the best times lay ahead for the Fightin Phils. The Phillies played five consecutive games with five or fewer hits, which was the longest stretch since July 26-31, 1969. Jason Giambi hit three home runs on May 19 against the Phillies, becoming the second oldest player to accomplish the feat. Citizens Bank Park was center stage for the Sunday night game against the Mets on May 1st as the nation watched Phillies fans react to the news of Bin Laden's death. Chase Utley played his first game of the season with the Phillies on May 23rd. Wilson Valdez pitched a scoreless 19th inning against the Reds to earn the win. He became the first player to start in the field and earn a win since Babe Ruth in 1921. Why did Phillies take Michael Martinez in Rule 5 Draft? When I see Michael Martinez I wonder, "Why?" Why did the Phillies pick Michael Martinez in the Rule 5 draft? What would make a team choose a career .263 Minor League player? The Phillies aren't blind to the stats, so what exactly do the Phillies see in Martinez? With his speed, it's easy to see why Michael Martinez caught the Phillies attention. He can create chaos on the base paths and has shown his versatility to play both infield and outfield. Players like Martinez can be valuable late in games and the Phillies haven't had a true speed guy like this since Michael Born. The problem is, since he is a Rule 5 player the Phillies must keep Michael Martinez for A MINIMUM OF 90 DAYS. No matter how bad he stinks, the Phillies are stuck with him until at least July 1st. Why handcuff yourself if you don't need to? It would be understandable if he succeeded in the minors like Victorino or if he came off an injury like Werth. But Martinez NEVER hit well at ANY LEVEL in the minors. Ruben Amaro is not stupid. He knows the numbers. So there must be more to it, something we don't know. 1. Maybe there were no players like Michael Martinez in the Minor Leagues. You mean to tell me that there wasn't one minor league player with speed and a .260 average? Players get drafted just for their speed and athleticism all the time. Heck, Michael Vick was drafted by the Rockies without playing an organized baseball game in his life! Call me crazy but there must be one bad hitter with speed in the entire Minor League system other than Martinez. 2. Maybe they couldn't find/weren't willing to take a similar player in the Majors. The name Eric Bruntlett says it all. The Phillies have a huge payroll and can't afford to waste half a mil on another extra man. But I again direct you to point #1. 3. Maybe his numbers show an upside we didn't see. Charlie Manuel seemed very high on Michael Martinez, so maybe the numbers will reveal the magical answer. In order to compare apples to apples, I prorated his numbers over 162 games. Prorating his stats over a full 162 game season, Michael Martinez never hit better than .272 in the minors, never had higher than a .330 OBS, never scored more than 90 runs, and never stole more than 38 bases. You may notice that his home runs and RBIs skyrocketed from 2009 to 2010. That must be it! But don't be fooled. Those are the only numbers that improved. The rest of his stats were similar to his career numbers. There is nothing in his numbers that suggests he will have a break out season. So my answer is...I don't know. If you run into Ruben at Wawa, be sure to ask him for me. I'm finally back from my trip to Los Angeles for a Muscular Dystrophy study. Sorry for the lag in articles, but no laptop and no home = no articles. But all was not lost, my friends. My trip to sunny California gave me a chance to compare Phillies fans and Dodgers fans. I can say now with certainty that Phillies fans are far superior to the Dodgers. Let me tell you, one week in Los Angeles made me proud to be a Phillies fan. Dodgers fans have the unfortunate reputation for arriving to games in the 3rd inning and leaving by the 7th. I always figured that was the laid back California attitude at work. I was quickly proven otherwise. On my second day in L.A. I ventured over to the Farmers Market and The Grove on 3rd & Fairfax. What a pleasant area it was to stroll on a beautiful, sunny day. Complete with a trolley, water fountain, and gentle music, this L.A. treasure offers a magnificent array of stores, restaurants, produce, treats, and entertainment. Entirely open to the elements, you won't see such a place in the Northeast. Anyhow, I had been exploring for several minutes before it dawned on me: I didn't see any Dodgers clothes. Maybe I wasn't paying enough attention, so I decided to take an unofficial tally of the amount of Dodgers gear. Get this: in an entire week in Los Angeles, I counted a total of 6 pieces of Dodgers apparel. Hard to believe, I know. If I were to walk the floors of any mall or the streets of any neighborhood in the Philadelphia area, I guarantee 6 Phillies items would appear in five minutes. Admittedly, I spent about half of my time in the hospital for the MD study, but just six in a week?! The next logical step to evaluate fans would be to catch a game at Dodgers Stadium, but I didn't have the time. Still curious to find Dodgers Stadium, I later tried searching in a phone book map. Jeez, I would have had an easier time finding Waldo. There was no mention of it in the enterainment sections of the book and it was barely a blip on the map. Wow, a stadium that holds 56,000 people (the biggest in baseball) hidden from the world. Even the Lakers were hard to find. That is enough evidence for me to conclude that L.A. residents simply don't care about their sports teams. C'mon, show a little love and wear Dodger blue! When the fans don't support the team and the city doesn't advertise the arena, Los Angeles is announcing to the world that they have better things to do. That might be the sign of a great city, but is also signifies bad sports fans. Enjoy the sun, surf, and movies, Los Angeles. In Philadelphia we will enjoy the Phillies. Let me steal a moment of time if I can for a brief PSA. Muscular Dystrophy includes a group of over 30 diseases causing weakness in muscles, which in many cases leads to early wheelchair use. The Muscular Dystrophy Association (MDA) is always in great need of help. You can provide a lot of help to a lot of people by donating at www.mda.org. Whether it be $5 dollars or $500, you can make a real difference in someone's life. The 2011 MLB draft could turn out to be an important one for the Phillies. The Phillies have the best record in baseball, the second highest payroll, and four Aces, so the draft isn't going to grab many headlines. But with the current Phillies squad aging before our eyes, the draft may play an increasingly important role over the next few years. For that reason, I thought I would use this time to take a look back at the Phillies draft history. Feel free to take a look at all Phillies draft picks since 1965, but I will focus on the last three GM's: Ed Wade, Pat Gillick, and Ruben Amaro. One quick look is all you will need to feel dirty about how you treated Ed Wade. Ed Wade's 8 drafts account for 7 current Phillies players and 8 from the World Series team. The last 5 drafts with Pat Gillick and Ruben Amaro have produced just one player on the current Phillies roster. Ed Wade is the clear winner in the GM draft competition. Wade drafted 19 legitimate major leaguers including 8 all-stars, one MVP, and two ace pitchers. Gillick drafted 4 possible legit players and the book is still out on Amaro, but they are both a far cry from Ed Wade. Ruben Amaro has done a great job in the free agent department, but 5 years from now it might be the draft that defines his legacy. With the window of greatness closing quickly, now is the time to stockpile those good draft picks. It can be fun looking back at some of the names and PhilsBaseball has a complete list of all Phillies historical draft picks if you are interested. You likely know by now that Roy Oswalt is heading to the DL and he might be there for a while. But don't fret, Phillies fans, because the Phillies top 3 are the top 3 pitchers in the NL, and probably the whole league. The numbers and rankings for Halladay, Hamels, and Lee are un-freakin-real. No huge analysis for now, but I had to bring it to your attention because you don't see this very often. I also suggest going to the mlb.com pitching leaders page just to see all our guys at the top. Now check out where Halladay, Hamels, and Lee rank in the National League. Be warned: I am going to go on a rant, but I will try to keep it clean. Domonic Brown still irks me two days after the stunt he pulled on Saturday night. There is simply no excuse for not running out a ball, especially for a young player. I just can't get over the sheer laziness and utter lack of intensity, energy, and excitement from Domonic Brown. I bit my tongue all year long about Domonic Brown, but not anymore. The signs have been here all along. Domonic Brown had the chance to be the savior for the Phillies this season, but there are several indications that Brown is not mature enough to be the superstar we hoped and still hope he will become. I remember Domonic Brown's first major interview after his call-up in 2009. Maybe it was just nerves, but his face was void of emotion and he didn't seem the least bit excited about his chance to play in the bigs. Here he is living every American boy's dream and he didn't even work a smile. And his wardrobe suggested he had already arrived. I'm definitely taking a cheap shot, but his first impression was not very positive. In two minutes Domonic told me that he was the chosen one and he is prepared to take his seat on the thrown. His first major league double. Brown sent a blast in his first at-bat deep towards the outfield stands. The fans left their seats as Brown started his first ever MLB home run trot. Problem was, the ball never left the park and Brown was left standing on second when he should have been on third. He deserved a pass for that day, but he still broke a cardinal rule of baseball in his very first game. Athletes like Domonic Brown aren't poor fielders. They just aren't. Yet Brown barely knew how to catch a baseball when he joined the Phillies. He wasn't a bad fielder because he lacked the skill. He was a bad fielder because he didn't care. All he wanted was to hit a bunch of bombs and get a big contract. But I will give him a little credit, because Domo has improved dramatically in right field since that point. It is now 2011 and Domonic Brown gets his first real shot. Domonic still aims for the moon with every swing. And I watch time and time again as he takes his good old time running to first. He is not the only one. Players do it all the time and we have many of those players on the Phillies. But shouldn't he be trying to impress his manager, coaches, and team-mates? Most of us were able to look the other way until Saturday when his lack of hustle cost him a hit. What bothered me more than his initial lack of hustle was that he didn't even run hard AFTER he was caught. I am most certainly piling it on Mr. Brown and I'm ready for the beating I will surely take from our readers. But I do it out of love. Look, an entire city expected him to replace Jayson Werth and become the next Ryan Howard. That's a lot of pressure to put on a 23-year-old. I hope that Domonic makes me look like a fool in a long, illustrious career with the Philadelphia Phillies. But for now, he has a lot of growing up to do. ** Don't forget that Hamels is the Phillies #4 pitcher, meaning his 15 starts one less start than nearly all leaders except Kyle Lohse (who also has 15). Hamels' next start should bump him up to third in innings. There is one huge advantage to great pitching and crappy hitting: the games fly by. Think about it. Roy Halladay and Cliff Lee are two of the quickest workers in the game. Cole Hamels takes the ball and fires it. Leave the bases empty, and Roy Oswalt is as quick as they come (just don't put runners on). Then you have the Phillies hitting: 4.05 runs per game (7th in NL), .246 average (10th), and 64 HR (8th). Less hitting means quicker games for Phillies fans. Put those two together and you can bank on getting to bed by 10:00 every night. But I wonder, how much time are the Phillies actually saving us? Meaningless topic? Maybe. But I just had to find out for myself. So, I went through the arduous process of compiling the game times of 158 Phillies games - all 79 Phillies game this season and the first 79 games in 2009. Why 2009 rather than 2010? Roy Halladay is a big reason for the quick games and he pitched in 2010, so I wanted to leave him out of the equation. 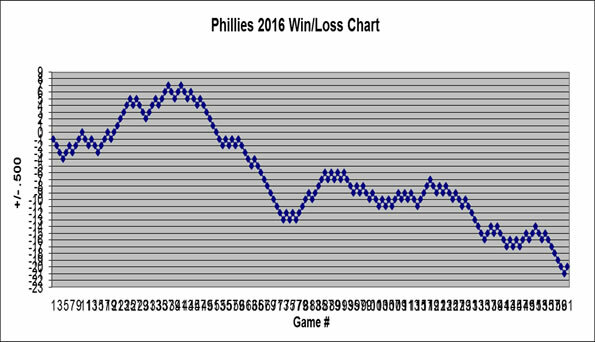 Plus, the Phillies really hit the ball in 2009. I eliminated all games beyond ten innings for obvious reasons. Games like the 19 inning affair lasting 6 hours, 11 minutes can really skew the numbers. I did not take into account any of the games where the home team did not get the last at-bat. That will have a small impact, but it seems pointless to go into that much detail. Now, let's get to the times. Each Phillies game is 5 minutes and 56 seconds faster than 2009. That doesn't sound quite as impressive as the total time, but that is still 6 minutes added to your life for each Phillies game. That's 6 minutes more sleep at night. That's almost enough time for light to travel all the way to the sun. Again, you get the picture.